Hyundai's battery-electric version of the Kona subcompact crossover. VANCOUVER -- Green is the primary colour at the Vancouver International Auto Show, even more now that gasoline tops $1.50 a litre here and automakers roll out more plug-in hybrid and zero-emission vehicles in key segments. 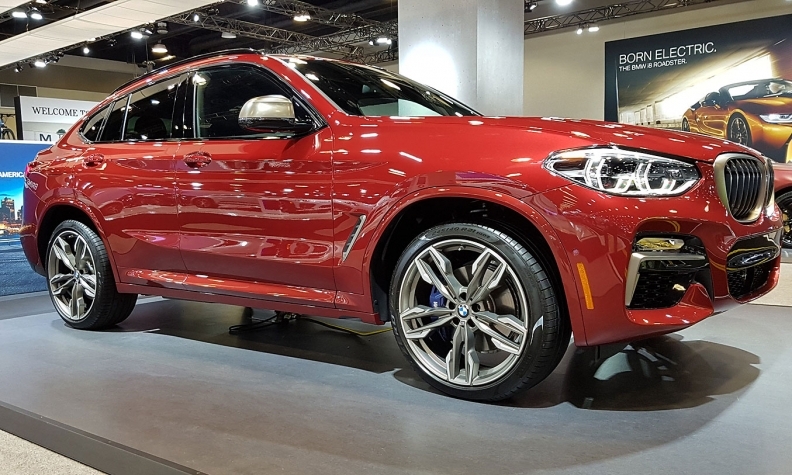 The wraps came off new conventional models, from BMW’s second-generation X4 crossover and a limited-production first-edition version of the new M5 performance sedan. But a lot of focus was on new or upcoming ZEV and PHEV models. Underscoring the market’s green-car heft, Hyundai unveiled the battery-electric version of the Kona subcompact crossover simultaneously Wednesday at the Vancouver and New York auto shows. 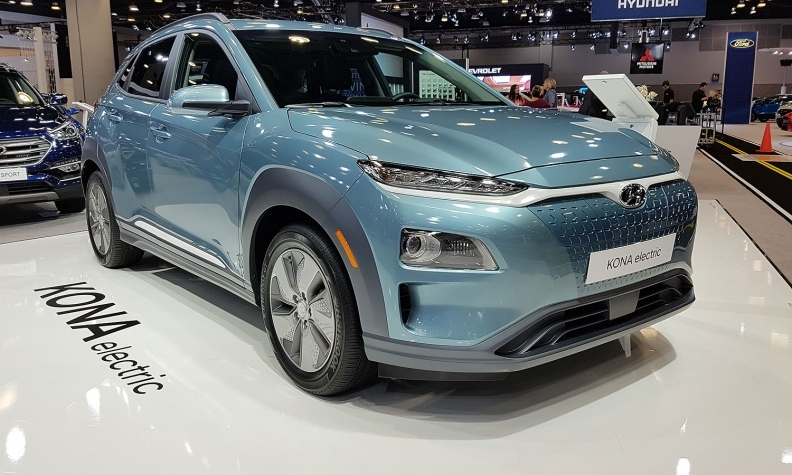 The Kona EV has a claimed 400-kilometre range, which Hyundai Canada president Don Romano noted trumps the 383 kilometres offered by the Chevrolet Bolt. It joins the Ioniq in the Korean automaker’s EV stable. Romano told Automotive News Canada he expects the EV, one of three Kona variants, to be in high demand in B.C., Ontario and Quebec, which offer generous incentives on EVs. Unlike its two siblings, though, the Kona EV will be front-drive only because the packaging of the battery pack for its 201-horsepower motor meant doing without all-wheel drive. It will be in dealerships in the fourth quarter of this year as a 2019 model. Mitsubishi's all-wheel-drive Outlander PHEV crossover. While Toyota showed a redesigned Corolla Hatchback, Vice-President Stephen Beatty claimed the company has more electrified vehicles in its Toyota and Lexus lineups than any other automaker. The Prius Prime PHEV, which was launched in Quebec last summer, is rolling out now in the rest of the country. Toyota plans a Quebec-first introduction for the Mirai hydrogen fuel cell EV toward the end of the year largely because the province’s refueling infrastructure is developing more quickly than elsewhere, said Beatty. BMW did not have a new EV to show here but national sales director Michael Ferreira said it sold 100,000 units of the i-series EV globally last year, with a sales goal of 140,000 this year and half a million PHEVs in 2019. By 2025 it expects 25 models to be PHEV or ZEV. Kevin Marcotte, national manager for i-brand vehicles, said BMW is shooting for its EVs to have 500-km range and 100-km fully electric operation for its PHEVs. 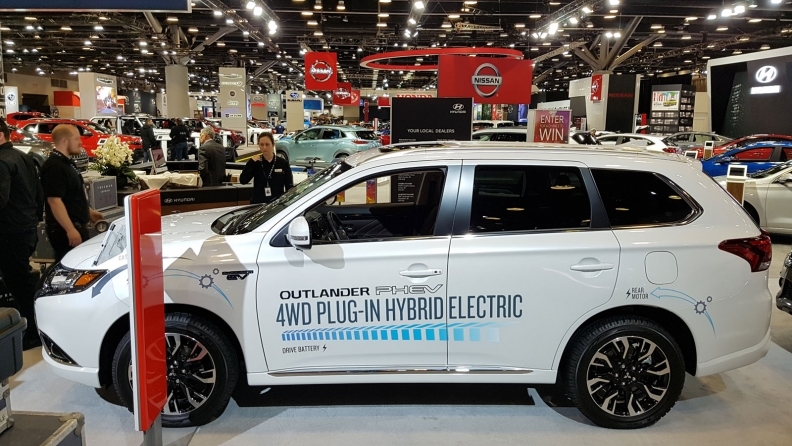 Over at Mitsubishi, Canadian president Tony Laframboise extolled the success of its new (to Canada) all-wheel-drive Outlander PHEV crossover, which last year posted sales of 100,000 in Europe. Expect Mitsubishi’s EV lineup to expand as part of its alliance with Renault and Nissan, Laframboise said. “In the next five years they’re developing 14 new electric vehicles and new powertrains that are coming out and we’ll be benefitting from that as well,” he said. In keeping with Vancouver’s perennial green theme, the Automobile Journalists Association of Canada presented the green car and green utility of the year awards to the Chevrolet Bolt EV and Kia Niro crossover hybrid respectively.